Please refer to our stock # 01466 when inquiring. 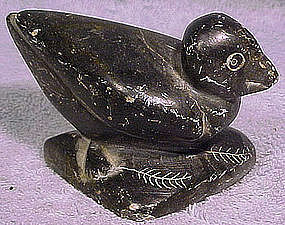 A 4" long and 2-1/2" high vintage Inuit Eskimo stone carving of a bird. This carving is signed by Josie Pappy E-9-861 (JOSIE PAMIUTU PAPIALUK 1918-1996). This item is in excellent original condition with no cracks, losses, damage or repairs other than a bit of bruising on the beak and a chip on one corner of the base. All items are thoroughly and conservatively graded and all condition issues are noted; all items are secondhand and may have slight signs of gentle use. Tracked packet shipping to the U.S. starts at $18 (other spots may vary) - insurance and tracking is included. Items paid with a credit card will be shipped to confirmed addresses only. We do ship internationally. All of our prices are in $US. PLEASE NOTE: we do not accept PayPal.